Last June 18th I wrote a post titled Translating Irrelevance: Why vendor “market share news” has little value in a practical sense. In that post, I questioned the relevance and/or value of reports that provide market share information relating to individual vendors. For example, who cares that SAP is the market leader with a growth of 24% and 23.9% market share, equivalent to $ 2.14 billion in revenue, or that Oracle is in second place with a 16.3% market share,followed by JDA Software? How is this helpful? Think about it for a moment. If you consider the rate of initiative failures – which industry pundits, articles and other reporting venues estimate to be between 70 percent and 90 percent, all market share means is that these organizations are good at selling bad outcomes. In the context of today’s post, how many of these vendors’ customers would be – in any practical sense, a good reference? This may not be an issue, if you are to accept the findings from the Jeff Cram article referenced in the opening paragraph. Cram’s lament that he see’s the lack of reference follow-up “as a gigantic missed opportunity for organizations that desperately need all the information they can get to make an informed choice,” raises the question . 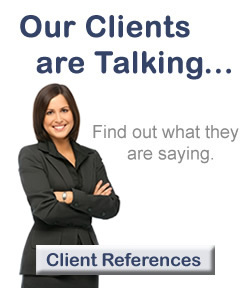 . . do client references really matter? Do they really influence buyer decisions to the point of tipping the scale in favor of one vendor over another? If not, perhaps the real issue is why? Why do companies fail to call the references provided by a potential supplier or partner? Similar to business plans with Venture Capitalists, or work references on resumes with potential employers, it appears that client references have little if any creditability with prospective clients in terms of their decision-making process. This would tend to suggest that the lack of follow through talked about by Cram, has little to do with a lack of time or poor research practices but, a lack of trust or faith in the actual value associated with the names being provided. Let’s face it, if 70 to 90 percent of all ERP-based procurement implementations failed to deliver the expected results, one might reasonably conclude that the reliance on references in the past have not been a good indicator of success in the future. I am not suggesting that by offering their names as a reference, existing clients have knowingly mislead prospective clients. If anything, and if you take into account the fact that most ERP implementations spanned several years, chances are the references that were given were based on a combination of optimism and desperate hope as opposed to actual results. However, and despite the questionable track record, references do have extrinsic as opposed to intrinsic value. With today’s SaaS-based, cloud solutions, that can be implemented within weeks if not days, thereby clearly demonstrating results, reference shelf-life is no longer an issue. Or to put it another way, a client doesn’t have to wait years to see if their strategy will pan out. They know within a relatively short period if a solution will or will not work, and can thus provide meaningful feedback. This new immediacy of return lends itself well to the reference process because it is no longer based on a buying decision with a forecast or hoped for result down the road, but an actual client experience in the here and now. In this light we appear to have come full circle relative to Cram’s assertion that references are not only important, but meaningful. Thanks for continuing the conversation Jon. I’d love to hear from some procurement professionals on this topic, as I only see one side of it from the service provider prospective. As I said in my original blog post, the approach to references seem to more about risk mitigation than helping inform a successful process, which seems like a huge missed opportunity. Not to mention frustrating when long term strategic decisions are made without digging into prior relationships and outcomes. Good stuff. Thank you for the feedback Jeff. I think you originally raised a very interesting question in that similar to press releases, we have become numb to references to the point where they are not a factor in the decision-making process – at least not to the extent that they should be. Qualifying references is an interesting idea, especially given the fact that the advent of social networking/networks has further diluted the value of an endorsement. I cannot tell you how many times I receive through sites such as LinkedIn, requests from people I do not know nor have done business with, for a reference on a quid pro quo basis. What absolute nonsense. Even purported reference qualifications sites loosely adhere to the reference qualification process. That said, I will check out your site and let you know what I think.